Making your senior portrait session appointment online is incredibly simple. Before you get started, make sure you have a credit card and your calendar handy. Then, just follow our screen prompts, complete our brief portrait client questionnaire and you'll be in front of our cameras in no time! Any questions? Just give us a call at 313-343-9060. Our "Ultimate" is our most popular senior portrait session. It includes a total of five clothing or prop changes AND allows you to include others in your session--your siblings, your pets, your best friends, Mom or Dad, you name it! Weather permitting, we'll also visit our Back Lot for some outdoor portraits, too! Our "Classic Plus" senior portrait session includes our "Classic" yearbook portrait session PLUS two additional clothing, prop or background changes. Bring your sports gear, your instrument--anything that reflects the real YOU! 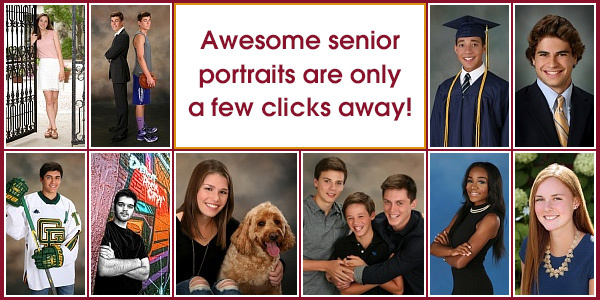 Our "Classic" portrait session is for those students who want a traditional, head-and-shoulder portrait for their yearbook PLUS some added 3/4-length and full length portraits. Your favorite image will be retouched and submitted to your yearbook.